Port Edwards receives $1 million grant to reinvent former paper mill | Vandewalle & Associates, Inc. PORT EDWARDS — A south Wood County community is one of six statewide to receive a collective $5.1 million in grants to help spur redevelopment on an abandoned industrial site, Gov. Scott Walker’s office announced Friday. Port Edwards will receive $1 million under the Idle Industrial Sites Redevelopment Program to help facilitate industrial development at the former Domtar Corp. paper mill site, recently renamed the Central Wisconsin Applied Research and Business Park. 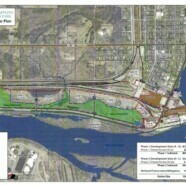 Other recipients selected to receive grants from this program statewide included sites in Beloit, Milwaukee, Waterloo, Madison, and Wausau which, similar to the Port Edwards site, is also a former industrial riverfront site. These grants are expected to have significant impact on local and area economies, adding jobs and new riverfront activity.